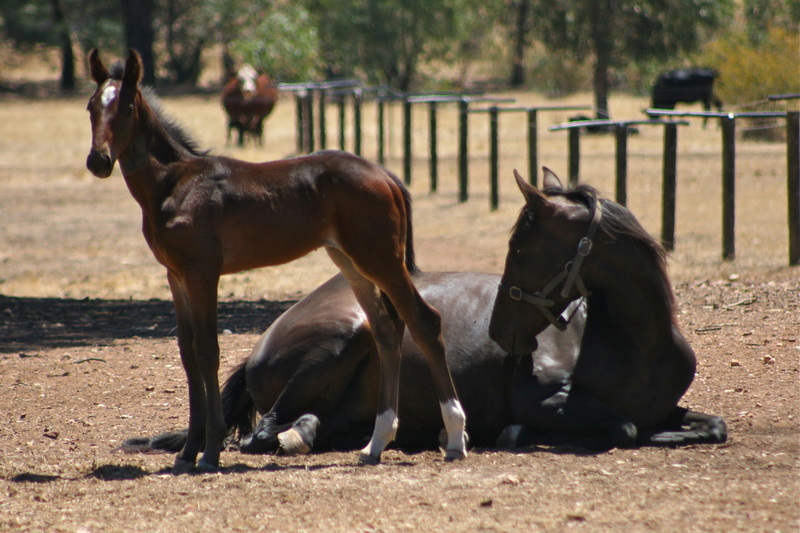 Dancer (one month and three days old) stands proudly in front of her mum Addy (Spirit Of Bendigo) . Dancer is a daughter of 2008 Oliver Wendell Holmes USA winner, Tiz A Masterpiece. BHRC committeeman Noel Ridge watches Tiser's trackwork at Maiden Gully 26/09/13. 28 November 2013 - After skinning her knees in a trackwork fall Tiser is on the road to recovery. 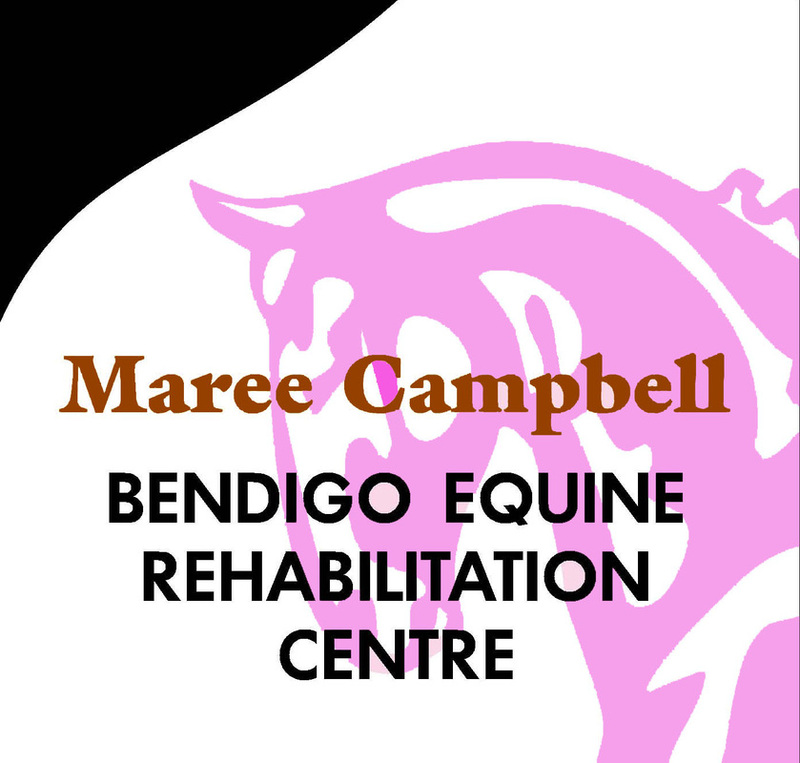 Operated on by the Bendigo Equine Hospital, Tiser spent a couple of months with her knees bandaged but co-ytainer Maree Campbell said the Race for Fun Club filly is now almost recovered from the injury. The accident set back Tiser training preparation and she is expected to return to work next month. 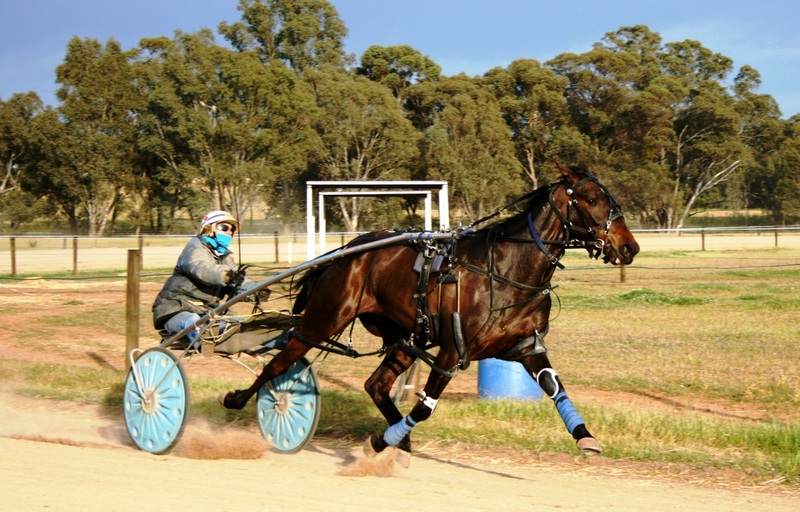 7 September 2013 - The Race For Fun Club’s new filly Tiser will step out in public for the first time at Sunday’s Bendigo Harness Racing Cub meeting at Lord’s Raceway. 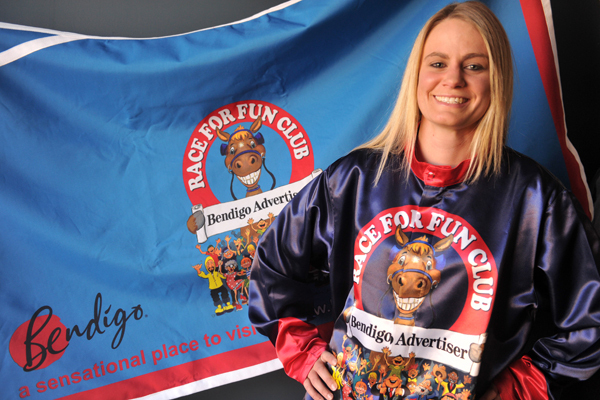 The Race For Fun Club is a free initiative by the Bendigo Advertiser and Bendigo Harness Racing Club that allows people to enjoy the experience of racing a real horse for charity. 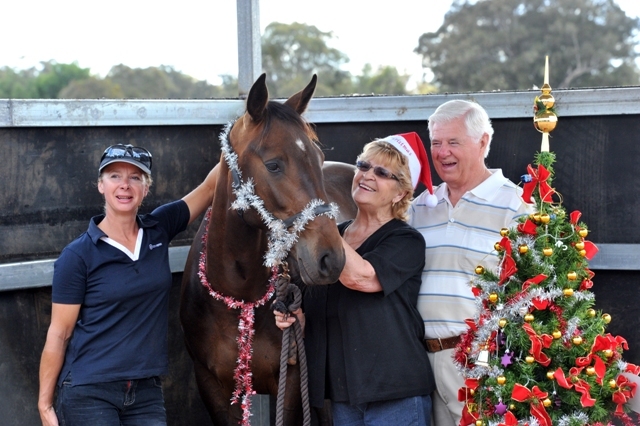 Tiser, who turned two last week, is Australia’s only fully sponsored racehorse.The filly is trained by Paul and Maree Campbell at Maiden Gully, fed by long-standing Bendigo business Bush’s Produce and cared for by Bendigo Equine Hospital. Bendigo Advertiser editor Rod Case said Tiser would be paraded between races two and three on Sunday. 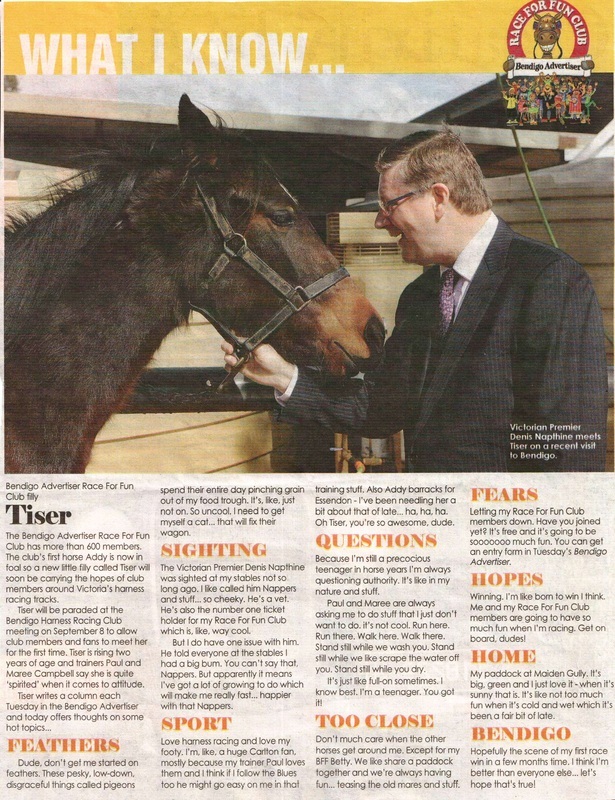 ‘‘There will be special stable tours so people can get up close and personal with Tiser and lucky draws throughout the day offering great prizes,’’ he said. Tiser has taken over the Race For Fun Club reins from original horse Addy, who is now in foal to Alabar Farms stallion Tiz A Masterpiece. 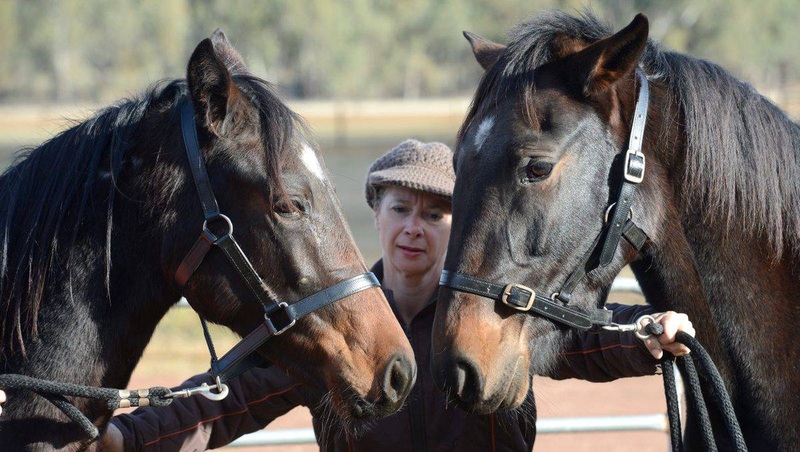 ‘‘Addy and now Tiser’s column each Tuesday in the Bendigo Advertiser continues to prove popular, so we hope plenty of people get out to Lord’s Raceway to meet her and even have their photo taken with her,’’ Mr Case said. ‘‘The Race For Fun Club is about getting as many people as possible, particularly families, out and about following an interest together. The Race For Fun Club has more than 600 members and is featured in a regular column each Tuesday in the Bendigo Advertiser. The first race on Sunday twilight program at Lord’s Raceway starts at 5.30pm. Fields for the meeting can be found in today's printed edition of the Bendigo Advertiser. 6 August 2013 - Victoria's Premier Dr. Denis Napthine visited Bendigo today and couldn't leave town without visiting his favourite Race For Fun Club fillies. Dr. Napthine visited pregnant mare Addy aka Spirit Of Bendigo and Tiser at Paul and Maree Campbell's Maiden Gully property. The premier is the number 1 ticket holder for the award winning Bendigo Advertiser Race for Fun Club. It was the first time that the premier had seen Tiser Sportswriter - Swift Flame) a rising 2yo who will be raced by the Race for Fun Club. "She has a big bum , a nice motor," the Premier quipped. 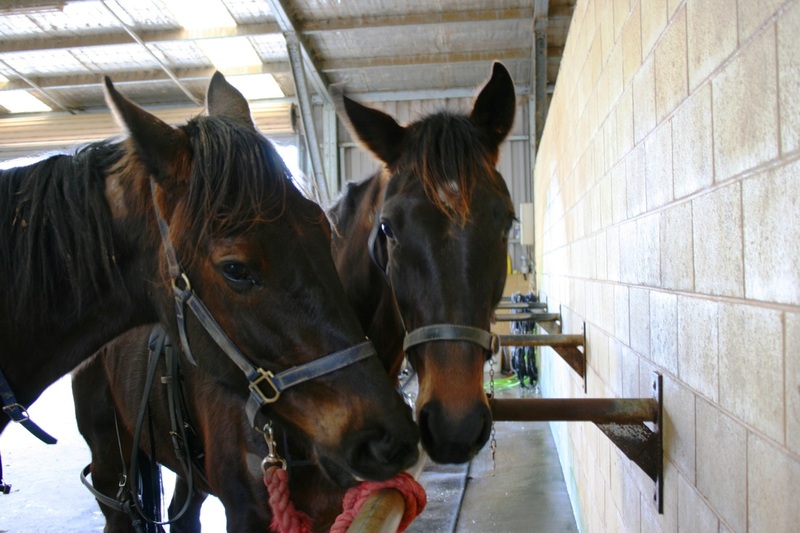 22 June 2013 - Our new Race for Fun Club filly, nicknamed at the stables Tiser, has completed her first phase of her training schedule as she prepares to become a racehorse. The rising two-year-old by North American champion Sportwriter from the well-related Swift Flame has progressed nicely, kunging and long reining before being educated to the sulky. Our little filly free-legged paced before getting used to the hopples and took to her new race gear like a pro. "We're happy with her, she has plenty of spirit which I like and she is learning quickly, a natural pacer," trainer Paul Campbell said. Paul and Maree Campbell put Tiser out in a grass paddock this week and she will rest up for a short time before commencing stage two of her training. "After that she will be given six weeks off to allow her to grow and develop before going into her training for her two-year-old season," Campbell said. 18 May 2013 - Meet the Race For Fun Club's new little champ. The Race for fun club is a joint partnership between the Bendigo Advertiser and Bendigo Harness Racing Club to promote trotting and give people an interest.The Race For Fun Club is a joint partnership between the Bendigo Advertiser and Bendigo Harness Racing Club to promote trotting and give people an interest. The club has more than 600 members, with Victorian Premier Denis Napthine, Opposition Leader Daniel Andrews, Women’s National Basketball League champions Bendigo Spirit and the city’s Victorian Football League team Bendigo Gold supporters. The club has more than 600 members, with Victorian Premier Denis Napthine, Opposition Leader Daniel Andrews, Women’s National Basketball League champions Bendigo Spirit and the city’s Victorian Football League team Bendigo Gold supporters. The unraced filly was born on October 20, 2011, and is by leading American sire Sportswriter.Her mum Swift Flame didn’t race but is a daughter of outstanding broodmare sire Live Or Die. Bendigo Advertiser readers will be given the chance to give the filly a nickname in the near future. 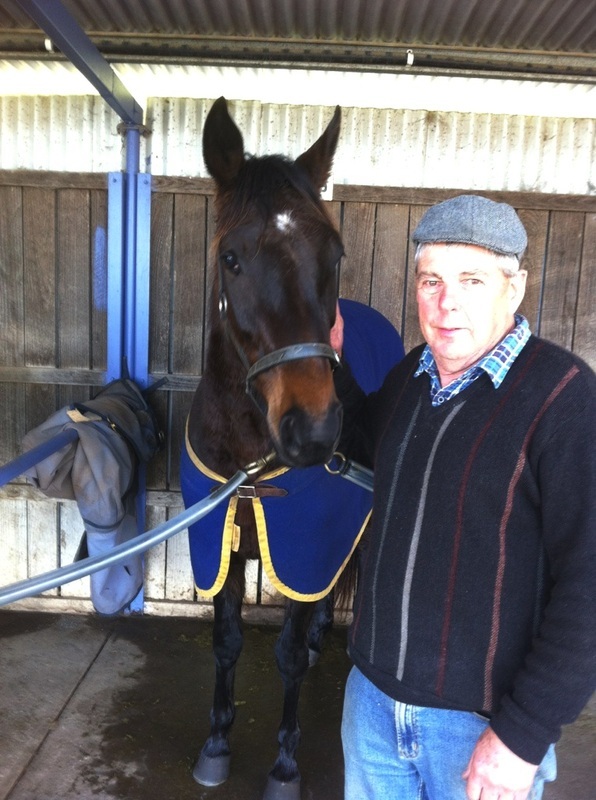 The filly will be prepared by Addy’s trainers Paul and Maree Campbell at Maiden Gully. ‘‘She’s a nice filly to get along with. She’s quite smart,” Mr Campbell said. ‘‘She’s got a much stronger build than Addy.” Addy and the new filly met for the first time yesterday. “She’s probably not as easy to photograph as Addy, as we found out today, but that will come to her, hopefully,” he said. “It was a little bit hairy in the beginning, to be honest, but it ended up OK.” Bendigo Advertiser editor Rod Case said the new filly, Addy and the Race For Fun Club would give readers a complete insight into the harness racing industry. “Bendigo Advertiser readers will go on a journey with the Sportswriter filly as she is broken in, educated and prepared for her first racing campaign,” he said. “It will be a great insight for our readers into how racehorses are prepared from the beginning. This will go well with our coverage of the breeding side of the industry with Addy having her first foal.” Bendigo Harness Racing Club general manager David Aldred said the new Sportswriter filly had a good pedigree. 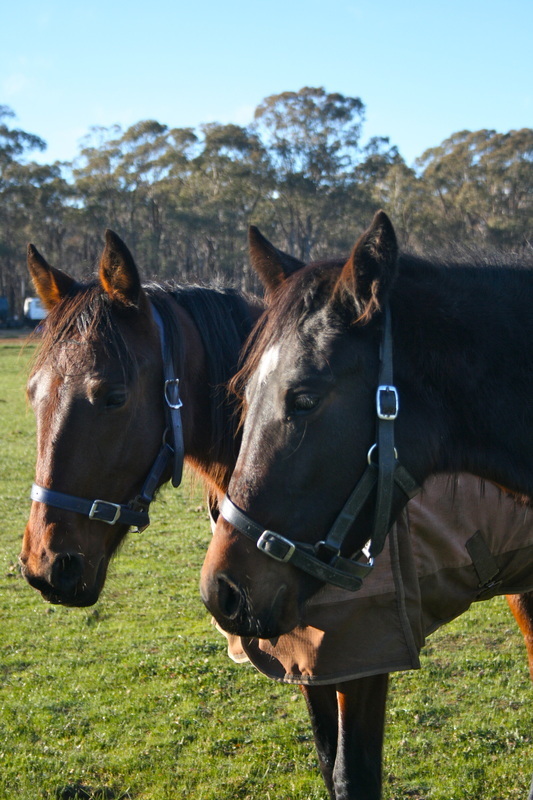 ‘‘The filly is from a Live Or Die mare – a prolific sire of winners and an outstanding broodmare sire,” Mr Aldred said.‘‘He has sired a staggering eight pacers to have earned more than $500,000 in their careers, including two millionaires.” The new Sportswriter filly will write her first column introducing herself to readers in the weekly Race For Fun Club column which appears on page 6 of the Bendigo Advertiser each Tuesday. 12 February 2013 - It's official - Addy is in foal to Alabar stallion Tiz A Masterpiece. The Bendigo Equine Hospital's Sarah Jalim confirmed a strong and healthy heartbeat with a 30 day scan conducted yesterday. Addy was retired from racing after a leg injury kept her sidelined. In the next couple of weeks, the Race For Fun Club expect to announce a replacement racehorse for Club fans to support on the track. 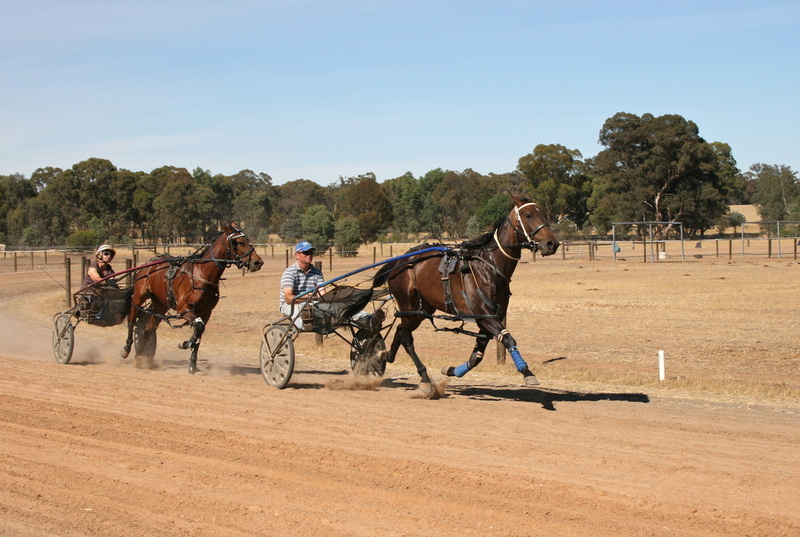 1 January 2013 - Trainer's Paul and Maree Campbell are proceeding cautiously and optimistically with Addy aka Spirit Of Bendigo as she starts her 2013 preparation. Addy has been sidelined, boxed at Campbell's Run Maiden Gully with an injury. Vets have looked her over and could not find anything conclusive that will prevent her from continuing to race. "We will proceed cautiously with her on the track and see what happens," Paul Campbell said today. The Lombo Pocket Watch three-year-old worked with two-year-old stablemate More Glory this morning. Addy's best result from seven race starts so far has been a third placing beaten a neck for the major prize at Shepparton. 20 November 2012 - Addy returned to training yesterday, a bigger and stronger horse. Paul Campbell said that Addy had put on 35 kilos during the two weeks that the Charity filly spent in the spelling paddock. "It's not fat, it's muscle mass," Campbell said. "She spent most of her time out lying down, resting and developing, which is actually what we wanted her to do." Campbell said he is hopeful that development will see a stronger Addy more competitive in her races. "She should be back at the races in three to four weeks," he said. 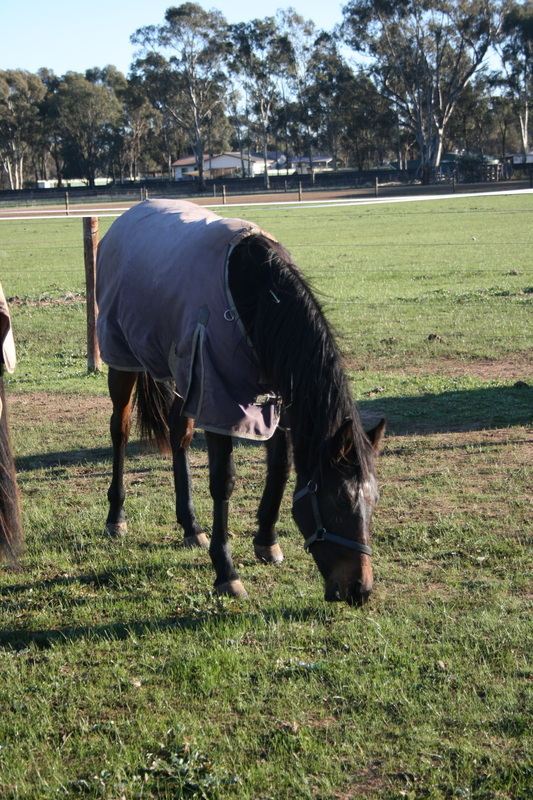 5 November 2012 - Addy aka Spirit Of Bendigo will graze on clover for the next few weeks after trainer Paul Campbell decided to spell the three-year-old charity filly following her disappointing effort when an odds-on favourite at Bendigo on Saturday night. Addy was driven hard to lead the 1690 metre race going out to race the first quarter of the mile in 28 seconds. Under constant driving Spirit Of Bendigo maintained the lead despite being attacked from the outset. Daryl Douglas worked the filly to lead into the final turn but Addy faded to third on straightening. With 150 metres to go she had done enough and was eased out of the race, finishing last. Campbell said the filly had a very tough run and will been given a couple of weeks in the paddock. Spirit Of Bendigo commenced her career in August, her best result in her first campaign was a close third, beaten a half neck at Shepparton in late October. Charity harness racing horse Addy and her Race For Fun Club have been recognised with a national award. Harness Racing Australia chairman Geoff Want said the Bendigo Advertiser and Bendigo Harness Racing Club’s innovation in creating the Race For Fun Club had earned the 2011-12 Award of Merit for demonstrated excellent in promotion. “The media plays a prominent role in the promotion of harness racing, so to see a regional newspaper and local harness racing club join together in such an innovative manner is a credit to the foresight of both organisations,” he said. “The Bendigo Advertiser has been a long-time supporter of racing and for it to now join together with the Bendigo Harness Racing Club in promoting the Race For Fun Club is further reinforcement of this. 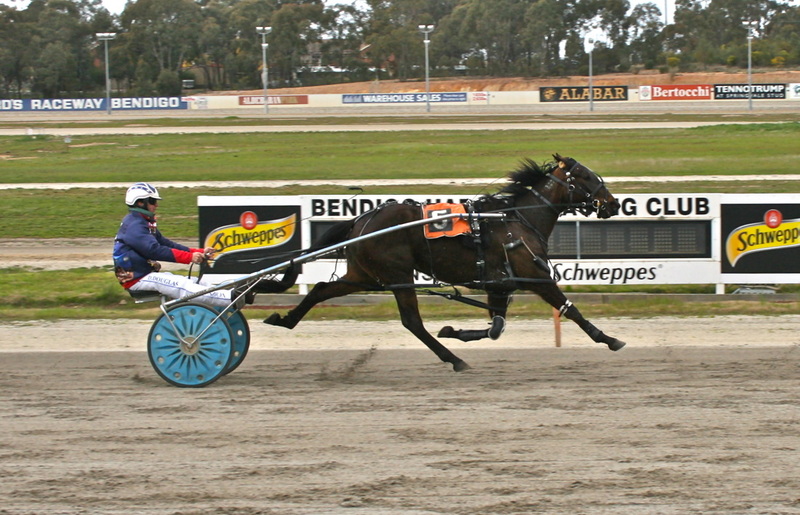 19 October 2012 - Spirit Of Bendigo stepped out at Kilmore last night with a eye-catching effort in the 3yo Fillies Pace. The Race For Fun Club filly was beaten less than two lengths, finishing her race off strongly for driver Daryl Douglas. In a blanket finish for the minor stakes, "Addy" just missed out picking up fifth prizemoney and was officially placed seventh in the 10 horse field. Glenferrie Lady (Jodi Quinlan) won the race in a 2:02 rate. Addy was officially beaten 7 metres. "That was a big improvment, she is getting there," Douglas said. "She responded to my driving and the run was quite good." Trainer Paul Campbell was also delighted with the improvement shown by the filly. Campbell said he is uncertain when Spirit Of Bendigo will have her next start. "This one's out of the way, she has improved so we will have a look at the program and see what is suitable for her next start," Campbell said. 27 September 2012 - Addy will have one more start before being sent to the spelling paddock after finishing eighth at Lord’s Raceway last night. 20 September 2012 - The Bendigo Harness Racing Club has put together a great family night of Fun, Prizes and Pizza for the Race For Fun Club on Wednesday night 26 September. Addy is set to race at this Bendigo race meeting in the 3yo Pace and Race For Fun Club fans are invited to make a sign and show their support for our Charity filly. Let's hope she get's a start and earns another cheque for Charity. So far her best effort was a fifth placing, earning $125 prizemoney. 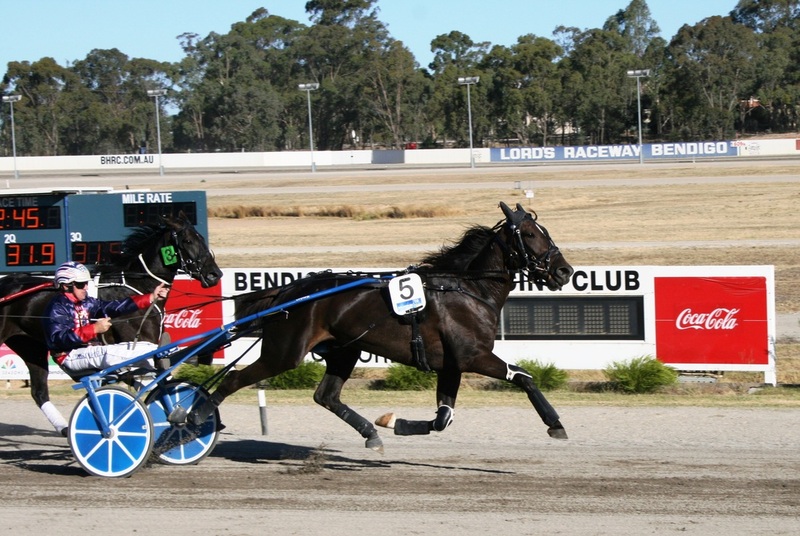 14 September 2012 - Race for Fun Club pacer Spirit Of Bendigo ran a credible sixth in her third career start at Nyah last night. Spirit Of Bendigo, or Addy as she is more commonly known, was forced to the rear of the field after starting from outside of the front row. She had no luck in running before making ground from the tail of the field in the final 200m. The filly finished 13m behind winner Catchthateye in a mile rate of 2.04.4. “I was really happy with her,’’ trainer Paul Campbell said of Addy’s run. “The Nyah track is every bit as tight as Mildura, but this time she was a lot more tractable. “They were going so slow up front that it was always going to be hard for her to make up ground. “She finished off the race well, there’s good signs there. Addy's stablemate Judyfree, a winner at Mildura recently, was forced wide in the race and finished back in the field. We’ll look for another race for Addy in the next fortnight," Campbell said. NB: Spirit Of Bendigo is likely to race on her home track at Bendigo on Wednesday 26 September. 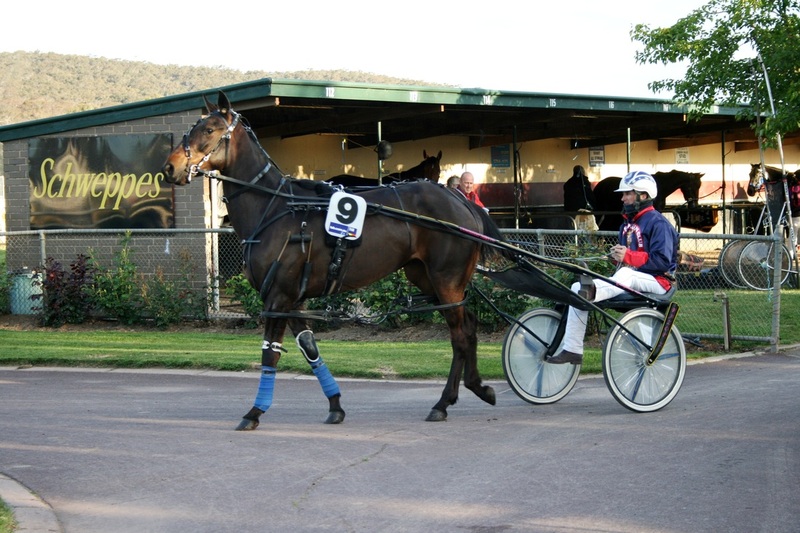 11 September 2012 - The Race for Fun Club goes on the road again this week with charity filly, Spirit Of Bendigo having her third start in a race at Nyah on Thursday night. The filly, better known to locals as Addy, had a confidence boosting trial win at Bendigo on Sunday. With Daryl Douglas in the sulky, Spirit Of Bendigo settled three back on the pegs in the 2150 metre trial before Douglas eased her to the outside on the final turn to make a move. "Addy" produced a stunning finish to reel in her rivals in the final 150 metres and scored by a neck in a 2:05 mile rate. "It was great to see her trial well after what happened (last start) at Mildura," trainer Paul Campbell said. "To see her really hit the line hard like that is very pleasing." At Nyah, Sprit Of Bendigo remains out of the draw and will start from gate seven in a field of nine in Race Two at 7:00pm. Her stablemate, last start Nyah winner Judyfree has drawn gate six in the same race. Campbell revealed this week that a foot abscess had played a role in Spirit Of Bendigo's failure at Mildura. 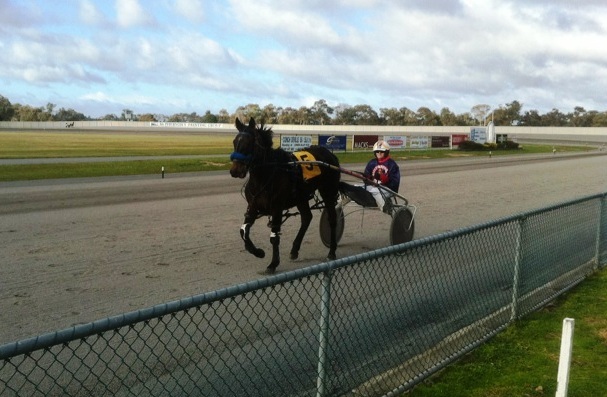 "It might explain why she didn't handle the tight turns at Mildura," Campbell said. "It's all good now and hopefully she will run a good race at Nyah on Thursday night." 10 September 2012 - Addy aka Spirit Of Bendigo took her first step towards a race victory today, winning a 2150 metre trial at Lord's Raceway. Driven by Bendigo ace reinsman Daryl Douglas, Spirit Of Bendigo started on the outside of the five horse trial. Douglas slotted the filly into third place on the pegs going out of the straight and kept her in touch with the leaders. After being momentarily pocketed passing the final quarter pole, Douglas switched Spirit Of Bendigo to the outside and she surged up to the leaders. Spirit of Bendigo hit the lead inside the final 75 metres and scored by a neck. She posted a 2:05 mile rate for the journey. Douglas reported to trainer Paul Campbell that the filly has definitely improved and for the first time she wanted to stretch out and find the line. Campbell is considering another race start this week for Addy and has penciled in a race at Nyah on Thursday night. 29 August 2012 - Maiden Gully trainer Paul Campbell is quietly confident that charity pacer Addy can put on a show for Race For Fun Club members tonight. 18 August 2012 - Charity harness racing horse Addy remains on track to make her race debut at Bendigo’s Lord’s Raceway on Tuesday night. Trainers Paul and Maree Campbell continued Addy’s preparation yesterday despite heavy rain at Maiden Gully. “Addy jogged on the lead behind another horse today,” Campbell said yesterday. “She will have a gallop on Saturday and then two jog days leading up to Tuesday night.’’ Campbell said Addy had recovered well from her third placing in a Bendigo trial on Monday night. He said the stable was happy with her attitude this week. “I think she is improving every time we do anything with her. We’re very happy with her,” he said. Addy carries the race name Spirit Of Bendigo and will start from barrier two in the Race For Fun Club 2YO Pace at 7pm on Tuesday. Bendigo-based reinswoman Ellen Tormey will drive Addy in her race debut. Bendigo Advertiser editor Rod Case said Addy would represent more than 600 Race For Fun Club members and many more interested fans at Bendigo on Tuesday night. “Addy has taken a while to mature into a racehorse, so it’s been a bit of a wait for club members to see her race but let’s hope they all turn out at Bendigo on Tuesday night to celebrate her debut and cheer her on,” he said. “Race For Fun Club members will be admitted free to the meeting. The first 30 members through the gate with their cards will get a special showbag. “We will have official Race For Fun Club hats for sale on the night so people can show their support for Addy. “We will also have a bit of fun where people who buy a hat for $5 will get to spin a wheel for the chance to win a prize. “Let’s hope we get a good crowd at Lord’s Raceway because that’s what the Race For Fun Club is about – giving people an interest and getting them out and having some fun.” Final fields and race times for the Bendigo meeting will be published in Tuesday’s edition of the Bendigo Advertiser. Follow Addy through her weekly Race For Fun Club column each Tuesday in the Bendigo Advertiser, her Addy’s Race For Fun Club Facebook page or her @AddyTalk Twitter handle. 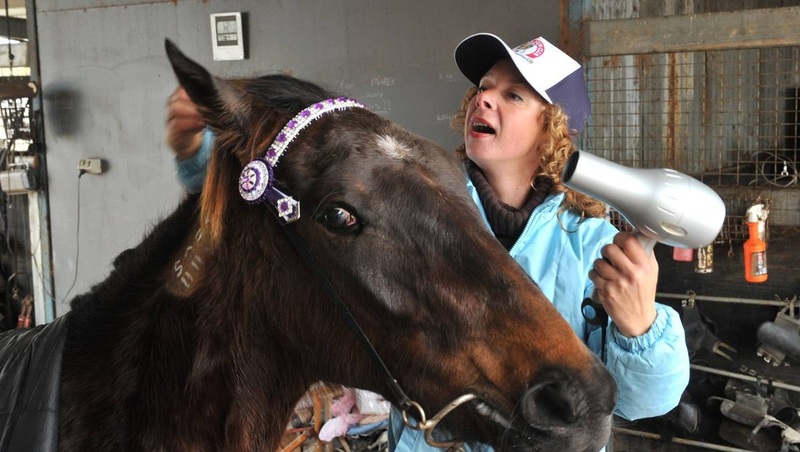 17 August 2012 - Australia’s only fully- sponsored harness racing horse Addy will make her race debut at Bendigo’s Lord’s Raceway on Tuesday night. Addy will represent more than 600 members of the Race For Fun Club under the race name Spirit Of Bendigo. 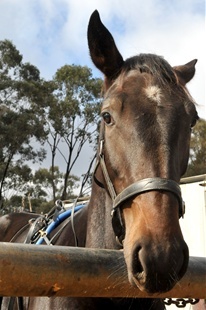 10 August 2012 - Race for Fun Club Charity filly Addy aka Spirit Of Bendigo will trial at Lord's Raceway on Monday night. Trainers Paul and Maree Campbell have made a couple of changes to her gear in an effort to have the filly more focused for Monday night's trial. 18 July 2012 - Addy aka Spirit Of Bendigo should go to the official trials again in a couple of weeks. Driven by ace Bendigo reinsman Daryl Douglas, the filly shaped up reasonably well in a searching trackworkout with two mates this week and according to her trainers Paul and Maree Campbell is still about a fortnight away from another public appearance. Paul and Maree said they would look for a trial or two for Addy in August with the hope of getting her to the races this season, likely having a race start at Bendigo in late August. 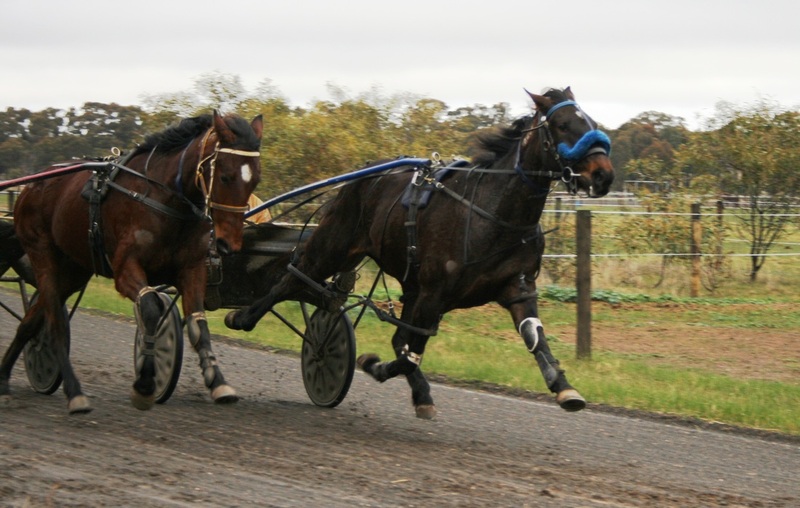 6 August 2012 - Australasian Young Driving Champion Ellen Tormey piloted Race for Fun Club filly Addy aka Spirit Of Bendigo in her return to the track at Maryborough on Sunday. Spirit Of Bendigo drew the outside of the five in the field and settled in last place. She worked forward during the race and finished fourth beaten around 10 metres. Trainer Paul Campbell said the trial was real flash but it was okay. "She didn't go bad but we would have liked her to do a bit more," he said. Campbell will make a couple of gear adjustments on the filly which iwill go back to the trials at Bendigo on Monday night 13 August. 2 July 2012 - Well can you believe its week 55 of the Race for Fun Club? Addy (aka Spirit Of Bendigo) is pleasing trainer Paul and Maree Campbell and had her first serious track workout in hopples this campaign on Saturday. "We're very, very happy." Payul Campbell said "She got up the straight (on a wet and sloppy track) in 14.2 seconds and she has pulled up good. She is much more alert and not going through the motions any more. We will keep upping her work until we think her fitness is a a stage we are happy with and go from there. "Paul said Addy was likely to do more galloping work this campaign. Happy Birthday Race For Fun Club - 1 year old this week! 13 June 2012 - This week marks the first birthday of the Race for Fun Club. The Bendigo Advertiser and the Bendigo Harness Racing Club thanks everyone for supporting the club and trust you have enjoyed the experience so far. Yes, it's been a little frustrating with 'Addy' taking some time to mature enough to make her racetrack debut and suffering an inflamed splint bone in her leg. We would have all loved to have been cheering her on in races by now but sometimes horses, particularly young ones like Addy, just take time to find the maturity needed to race. The Bendigo Advertiser and Bendigo Harness Racing Club would like to thank Paul and Maree Campbell for their fantastic efforts in training Addy and ensuring she was available for photographs and public appearances in the first year. Paul and Maree feel confident Addy can make a racehorse and their patience has been wonderful for the club. Management also thanks every sponsor who has supported Addy and the Race for Fun Club to date. Without them, this concept would not be possible. Those sponsors include: The Bendigo Advertiser, the Bendigo Harness Racing Club, the City of Bendigo, harness racing trainers Paul & Maree Campbell, Alabar Bloodstock, PetStock, Mitavite, World’s Best Hoof Oil, Hylands Harness Gear and Sportswear, Bendigo Equine Hospital, the Equine Dental Association of Australia, Garrards Horse & Hound, Hygain, Bendigo Equine Rehabilitation Centre, Mustad Australia, farrier Nathan Monk, Warehouse Sales, Golden Square Hotel and Clark Rubber. Clearly, the Race for Fun Club has done much to raise the profile of harness racing and Bendigo. This was recognised with a Harness Racing Victoria Award at the Rothacker Medal night during season. There have been some great highlights in the first year of the Race For Fun Club with Addy making many public appearances, including leading the famous Bendigo Easter Gala Parade in front of tens of thousands of people. More than 70 enthusiasts also braved a cold, wet and windy morning to watch her first trial and that was great. Addy continues to draw the support of the Victorian Government’s Minister for Racing Dr. Denis Napthine and Victorian Opposition leader Daniel Andrews among her Race for Fun Club membership. But equally as important, she has members across central Victoria, and even Queensland, who remain very important to the success of the Race For Fun Club. We hope the second year brings Addy's much-awaited racetrack debut and we still look forward with great excitement to the night or day Race for Fun Club members gather on the track with Addy for a victory picture after her first win. PS: Don't forget to follow Addy' personal column each Tuesday in the Bendigo Advertiser where of late she's been boasting about leading the newspaper's AFL footy tipping experts competition and through her Addy's Race For Fun Club Facebook page and Twitter account. 2 April 2012 - Bendigo Gold has joined the Race for Fun Club. Bendigo's Victorian Football League teamed joined the BHRC, Bendigo Advertiser Club to support the community. 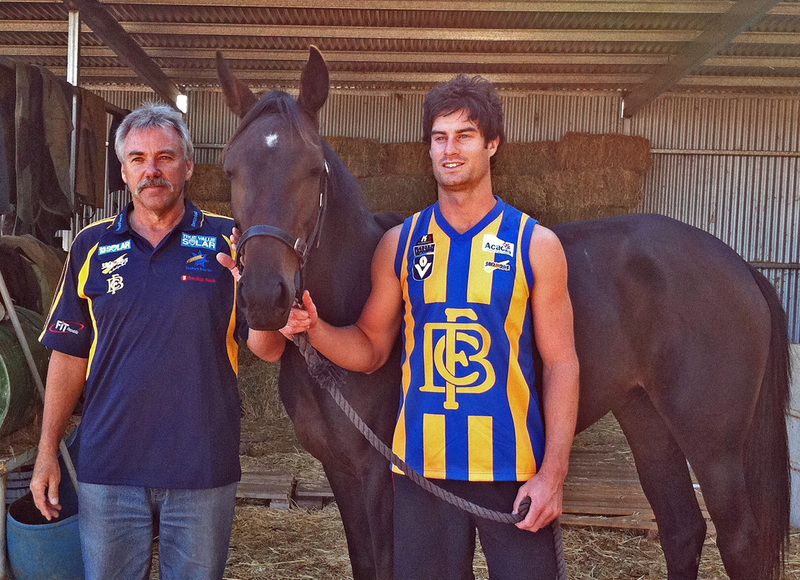 Bendigo Gold General Manager Graham Pratt and player Brad Collins visited Paul and Maree Campbell's Maiden Gully stables to meet Addy before Saturday's match against Frankston. "To us being part of the Race for Fun Club is something to get us further involved with the Bendigo spirit in the community," Mr Pratt said. "We're here in Bendigo, we're the top level of football you can play and we want to be part of things in the Bendigo community. " I really liked Addy. "I'm no expert on horses, but she's a very good looking horse and has a good temperament. "Plus, she kept nuzzling up to me, so she obviously like me as well." Bendigo Harness Racing Club General Manager David Aldred said it was fantastic to see a Bendigo based sporting team sign up for the Race for Fun Club. Mr Aldred said he was hopeful that more local sporting clubs would follow the lead of the Bendigo Gold and the Bendigo Spirit basketball team and join the Race for Fun Club. 23 March 2012 - Champion Bendigo reinsman Daryl Douglas will steer Addy aka Spirit of Bendigo at Lord's raceway on Sunday. The Race for Fun Club pacer will return to the track after the scheduled trials on Sunday morning to compete in a workout 'runaround'. Trainer Paul Campbell said he is keen for Douglas to take the reins and give his opinion of Addy's progress. Addy is scheduled to trial again on Sunday week and will be racing soon after. Addy steps up a notych - trackwork 23 March 2012. She will head back to the trials next week and race soon after. 14 March 2012 - Addy will pull a revolutionary Razor sulky when she steps out in future trials or races. The latest sulky on the market ism locally made by Steve Loftus at Ballarat. Paul and Maree Campbell purchased one of the first sulkies off the production line and used it on stable star Dual Agent Tabman at Lord's Raceway last weekend. Harness Racing Australia and Harness Racing Victoria Stewards only approved the new american style racing cart this month. 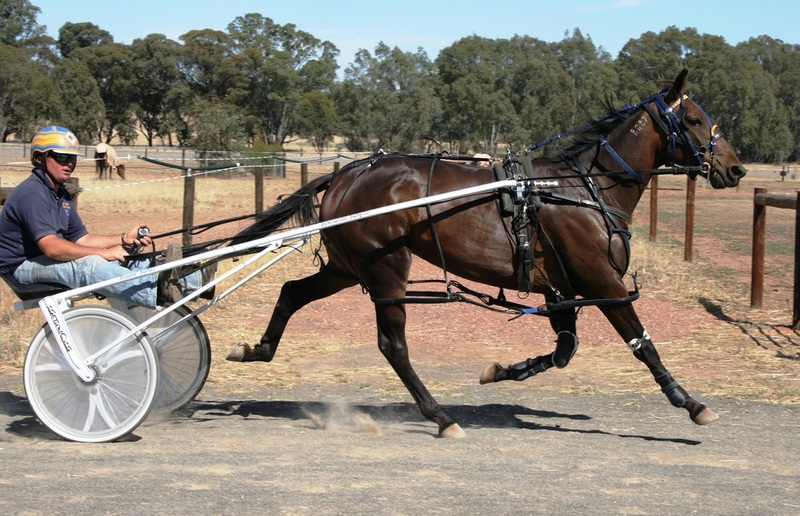 The sulky had to pass rigorous tests by official testers in Sydney then be approved by local officials before it was allowed to be used in races. The Razor sulky is made from chromolly aircraft tubing. 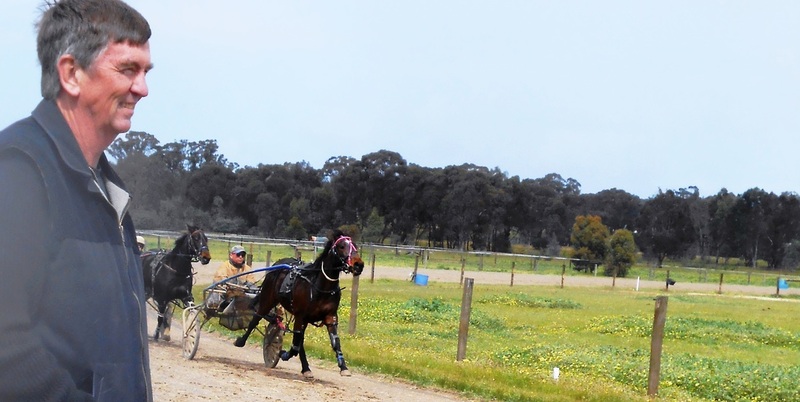 Mr Loftus, the harness racing track curator at Ballartat, designed and made the sulky and said that he wanted to provide Australian trainers with a good alternative to the american and canadian style sulkies that are having a lot of success in races here. "Its important that trainers have a sulky that can be easily repaired locally and I believe my sulky is better than the imported product," Loftus said. 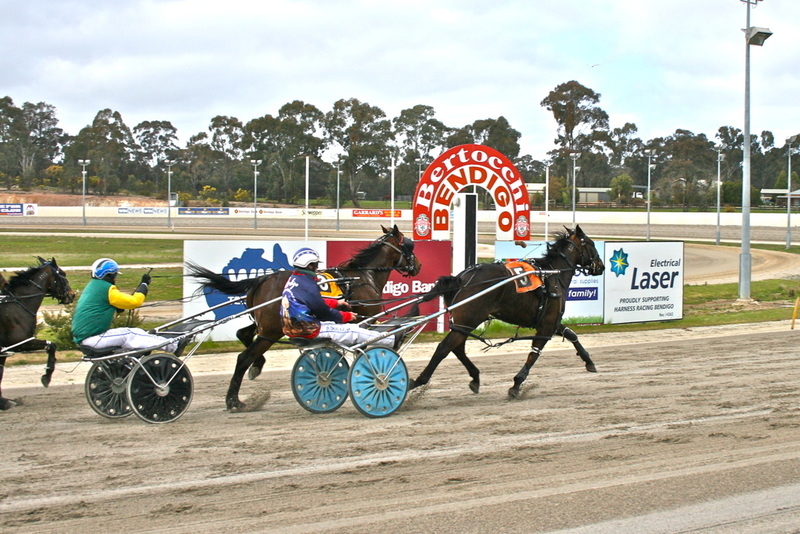 8 February 2012 - Trainer Paul Campbell has prescribed a short break for Spirit of Bendigo after the Lombo Pocket Watch filly's qualifying trial at Bendigo this week. "Addy" did everything right but there was no speed in her tired legs over the concluding stages of the 2150 metre test. The trial was won by Dieing Secret in a 2:04 mile rate, which was a full second faster than the previous 2yo trial on the night. "I'm not unhappy with her placing fourth of the four starters, she did everything right, but was just tired at the end," Campbell said. "We will reassess our plans and will not race her on the 23 February, instead she will have a couple of weeks off, a change of scenery and hopefully come back fresh to prepare for her race debut. 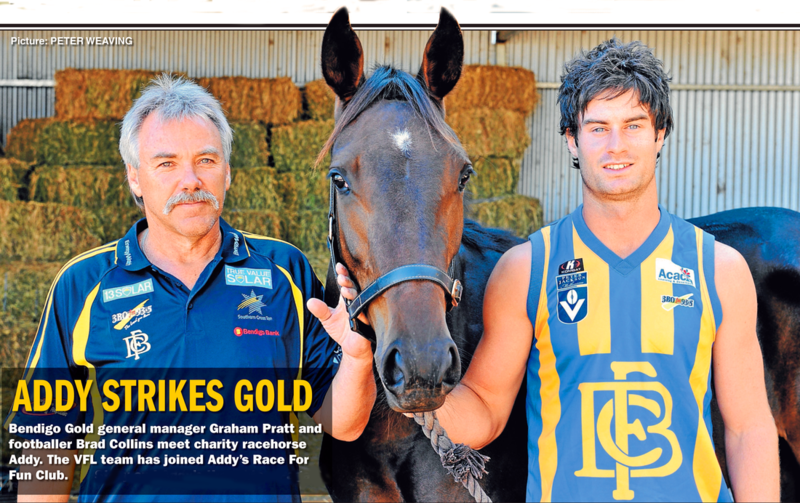 20 December 2011 - Addy has a race name, she will race as Spirit Of Bendigo. 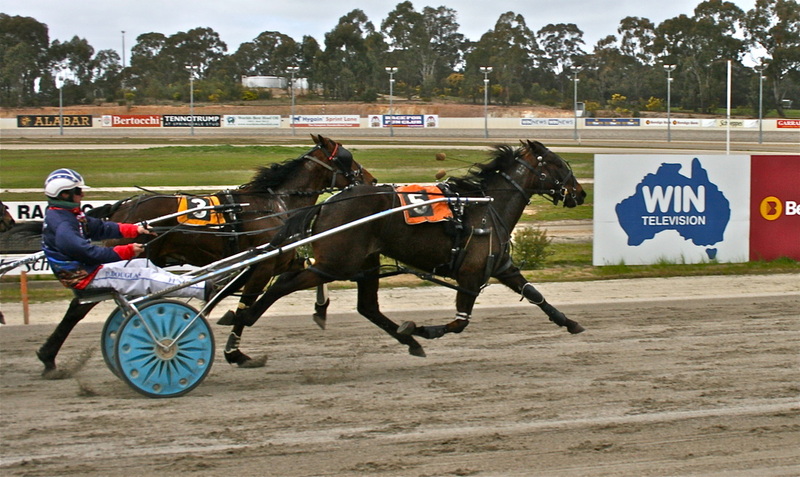 Harness Racing Victoria ratified the name yesterday. The name was supplied by Race For Fun Club member Kathleen Chester who wins a Gold Coast Holiday with five nights at the Palms Resort and $400 travel. Mrs Chester said she got the inspiration for the name after meet "Addy" with her husband John and her grandchildren at the Bendigo Harness Racing Club Race For Fun Club promotional day. "She's a beautiful horse and when I saw her I thought she had a bit of spirit," she said. The other names submitted to HRV were: Go Go Bendigo; Queen Of Bendigo; AroundtheBendIgo; Bendigo Gold and Goldfields Flyer. Race for Fun Club member Estelle Kauter has won the Blu Ray player from Warehouse Sales (Bendigo) in the naming compeition lucky draw. Move over Black Caviar... there's a new people's horse in town. The Bendigo Advertiser and Bendigo Harness Racing Club have secured a filly from Alabar Stud to race for charity and to promote Bendigo. The filly, who carries the stable name 'Addy', will be trained by Paul and Maree Campbell at Maiden Gully. She will wear special racing colours carrying an iconic picture of Bendigo on the back and the words: Bendigo - a sensational place to visit. We want you along for the ride. Ownership of the filly will officially be registered with Harness Racing Victoria as Bendigo Advertiser. We are now on the lookout for fans of the filly to join the Race For Fun Club. What's in it for individuals, families, business groups and community groups or organisations that get involved? Grab a copy of the Bendigo Advertiser to find out all you need to know about 'Addy' Race For Fun Club membership and register today. 24 November 2011 - Wow, we haven't even hit the ractrack yet and we are already winning awards! - The Bendigo Harness Racing Club has won the 2011 "Best Local Media' Award at the Gordon Rothacker Medal night held at Tabcorp Park, Melton, last week. The Award was for the Race for Fun Club with Addy's publicity in the Bendigo Advertiser blowing away the judging panel. BHRC President Dennis Bice and GM, David Aldred collected the award in front of 400 racing industry participants. The BHRC and the Bendigo Advertiser thanks everyone who has supported the Race for Fun Club and making it a great success. We look forward to your continued support - Go Addy! 4 November 2011 - Bendigo's charity pacer Addy’s official Race For Fun Club colours will contest the Group 2 $50,000 Legends race at Tabcorp Park Melton tonight. Victoria’s premier trainer Glenn Douglas will wear the colours when he drives Our Hillview Gold from barrier eight in the meeting’s feature race. Bendigo Harness Racing Club general manager David Aldred said Our Hillview Gold was an each-way chance. “He won last year’s Charlton Cup and is in great form with a win and a second from his last two races,’’ Mr Aldred said. “Last week he was runner-up to Captain Joy, one of the favourites for this race. Glenn said he hoped to get a good run into the race early. “This is the first time the Race For Fun Club colours have been worn at Melton and for Glenn to put them on a top horse in a Group 2 race is fantastic." Bendigo Advertiser editor Rod Case said the colours would promote Bendigo to a big crowd at Melton tonight. "It will be great to see the colours carrying an iconic image of a floodlit Alexandra Fountain and the words ‘Bendigo: A sensational place to visit’ parading before a huge crowd," he said. 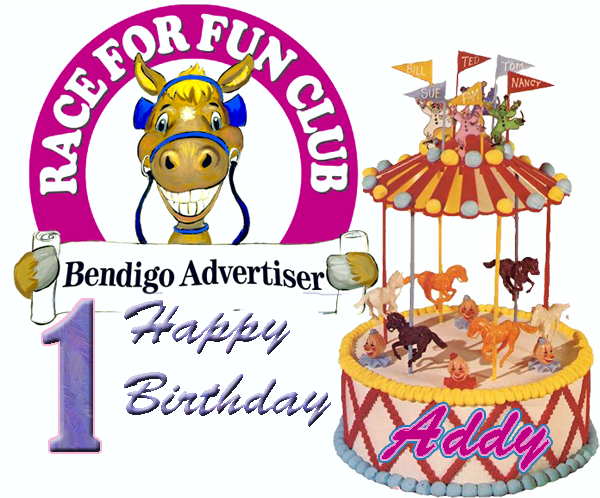 Follow Addy each Tuesday in the Bendigo Advertiser or through her Facebook page Addy’s Race For Fun Club. 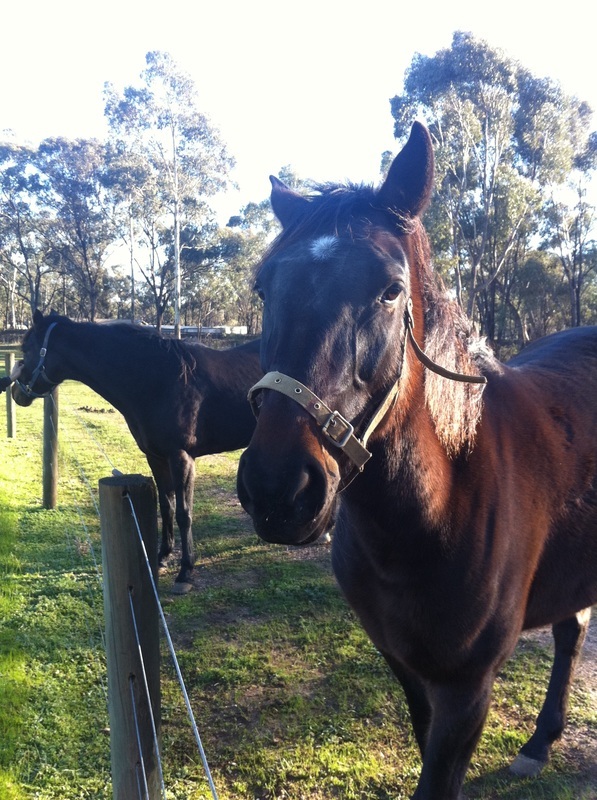 Meanwhile Addy's older half-sister, Whatareyouwearin races in the fourth race at Globe Derby Park, Adelaide tonight. Trained by Greg Simms Whatareyouwearin will start from the second row in the 3yo & Older Pace. Addy needs a race name. Enter the NAME ADDY COMPETITION for your chance to WIN a fabulous Gold Coast Hoilday for two people plus $400 travel. Details in today's Bendigo Advertiser. Also a Lucky draw for a Blu Ray Player to be won. All thanks to Bendigo Harness Racing Club, Bendigo Advertiser, Bay of Palms Resort (Gold Coast) and Warehouse Sales (Bendigo) - Join hundreds of others and share in the excitement of racing charity filly Addy, a 2yo daughter of Lombo Pocket Watch, with the Bendigo Advertiser. IT'S 100% free. Membership forms in today's Bendigo Advertiser newspaper or log on to www.bendigoadvertiser.com.au for more details. 1 October 2011 - State government minister Denis Napthine was a man of many hats during a visit to Bendigo this week. 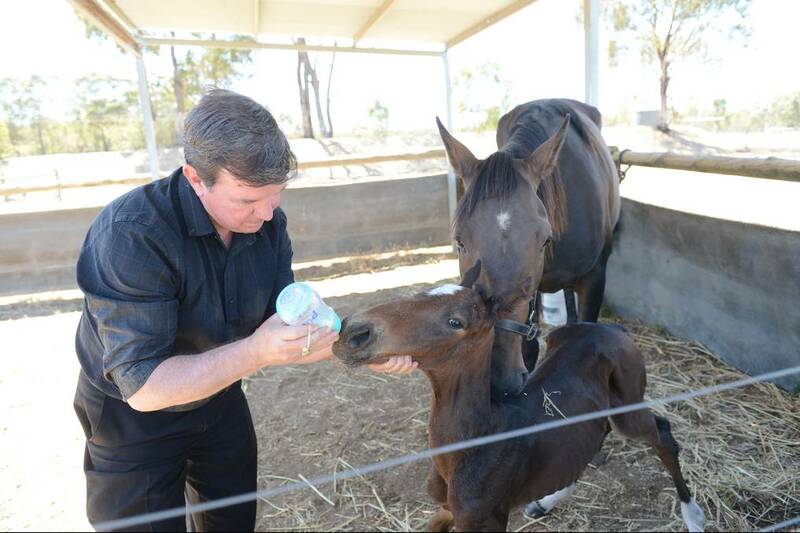 Dr Napthine, the state’s racing minister, channelled his former profession as a veterinarian when he opened the new Bendigo Equine Hospital for Dr John Brown. The new hospital is across the road from the entrance to the Bendigo Jockey Club and comprises stables along with surgical and examination facilities. 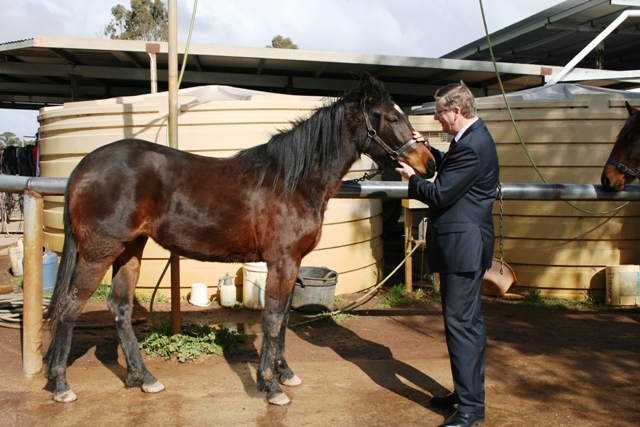 During his visit to the city, the Minister capped off his visit with a trip to visit charity race horse Addy at Maiden Gully. He has been a vocal supporter of the Bendigo Advertiser’s Race for Fun Club since he joined earlier this year. Membership is still available in the Race for Fun Club with some huge competitions and prizes to be announced by the Bendigo Harness Racing Club and The Advertiser in the coming weeks. 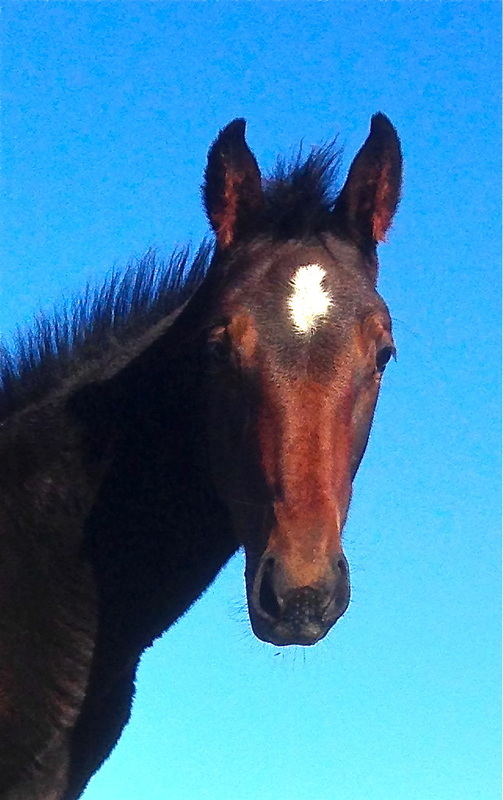 Membership to join in the fun of racing Addy, a 2yo filly by Lombo Pocket watch from Nw Zealand mare Flaming Fuel, is 100% free. Look in Tuesday's Bendigo Advertiser for more details and a weekly update on Addy's progress. Addy has been slowly building speed with hopples on during three-horse workouts on the Maiden Gully training track this week (week 11). Trainer Paul Campbell said Addy continued to do everything right in training. Campbell said the stable had been changing workmates around for Addy to get her used to other characteristics shown by different horses. He said the young horses swapped and changed positions during the workouts to teach them how races could be run but under controlled conditions as they continued to build up speed. Race For Fun Club star ‘Addy’ will have access to state-of-the-art equine technology at the new Bendigo Equine Hospital in White Hills. Bendigo Equine Hospital owner and head veterinarian Dr John Brown has offered the facilitiy’s services to Addy free of charge in support of the Bendigo Advertiser’s Race For Fun Club. Dr Brown, well known for his specialised equine services at the Bendigo Animal Hospital, said the new facility would lead the way in equine health. “It’s a secure site, and it’s drive in, drive out,” Dr Brown said. “It has a good examination area and really state-of-the-art equine surgery and consult rooms, 10 horse boxes and a fully functional office block. “It will be run as a primary access and also as a referral surgery hospital. ‘‘We’ll have the services of Dr Sarah Jalim, who is a fellow at the Australian College of Equine Surgeons, as well as Alister McLain, my partner 20 years ago, who will be coming in as a specialist surgeon.” Dr Brown said he was proud supporter of the Race For Fun Club. “I think it’s a fantastic concept just to get people interested in racing and to have a little bit of fun,” he said. “It’s not about making a lot of money - it’s about trying to get racing back into the entertainment side of things. “We are doing vet work on Addy free of charge, so he’ll be in safe hands." Victoria’s racing minister has offered a glowing endorsement of a horse the Bendigo Advertiser will race for charity. 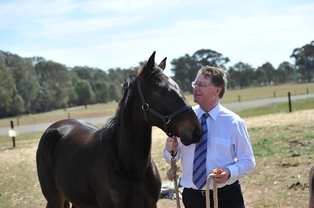 Liberal MP Denis Napthine honoured his promise to meet harness horse Addy. Dr Napthine turned the clock back to his former profession as a veterinarian to offer an assessment of the two-year-old filly. “I am very confident about her prospects,” he said. “She’s well bred. Lombo Pocket Watch was one of the best, most exciting pacers and that is her dad... she comes from a good sire side, a good dam side. “She herself is a relaxed, well conformed young filly with all the potential to be a very good and very competitive race horse.” Dr Napthine assessed Addy’s legs and rump and predicted she would be a powerful harness horse. “I would encourage anyone to sign up and lend their support to Addy,” he said. “I have no doubt that she will be able to deliver the goods when she takes the track. “I am positive that the interest in Addy will get plenty of people through the gates at Bendigo and around the state so I am proud to offer my personal support to Addy, who I am sure will have a long and successful career.” Dr Napthine met Addy’s trainer, Maiden Gully’s Maree Campbell, at Bendigo’s harness racing track. 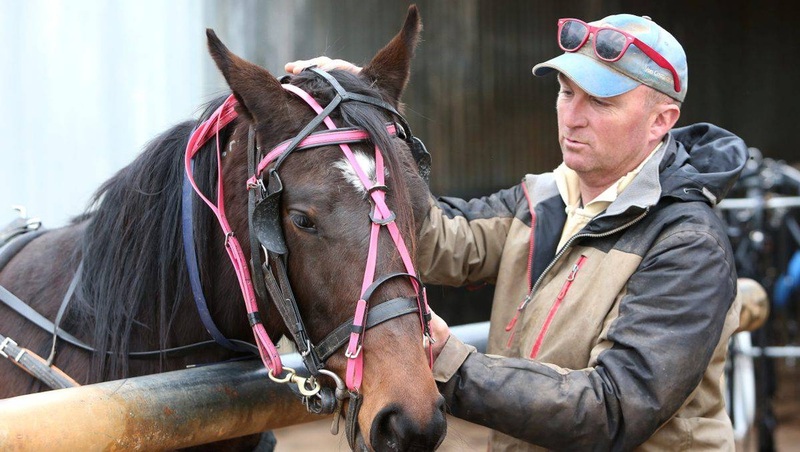 He had his first experience in a sulky behind a harness horse and met students at the Bendigo Harness Racing Industry Training Centre, which trains 140 people each year to become stable hands, drivers, trainers and stewards. Dr Napthine said he looked forward to watching Addy race. “There is no doubt when she is racing I’ll be there and if the journalists at the Advertiser haven’t knocked off the odds I might have a dollar or two on her,” he said. 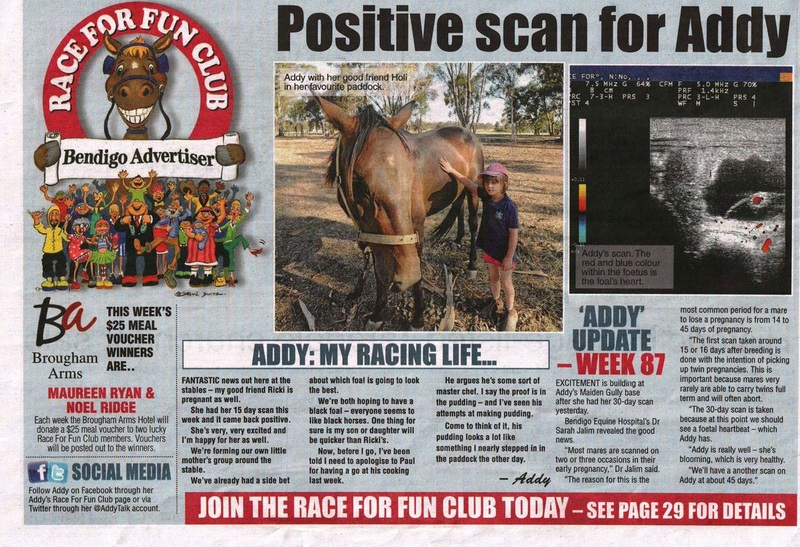 Support is growing for the Bendigo Advertiser’s Race For Fun Club horse “Addy”. The club has attracted Race For Fun Club members from Bendigo, Elmore, Charlton, Korong Vale, Woodvale, Wycheproof, Heathcote, Neilborough, Maldon and Pyramid Hill in the first week. “Addy” will race for charity and promote Bendigo with her racing colours carrying an iconic image of the city and the words: Bendigo – a sensational place to visit. Race For Fun Club members will pay nothing to share the excitement of “Addy” during her harness racing career under the guidance of Maiden Gully trainers Paul and Maree Campbell. Two prominent Bendigo businesses have also jumped on board the Race For Fun Club and will soon be featured in the weekly update on “Addy” each Tuesday in the Bendigo Advertiser. Bendigo Harness Racing Club general manager David Aldred said the harness racing industry was abuzz about the Race For Fun Club. “I think the most asked question has been how much does it cost to become involved and when the answer is it doesn’t cost anything, well, they are just blown away," he said. “Anyone in the family can be a fan of ‘Addy’ and join in the thrill of her racing, getting a taste of what it’s like to be a horse owner." The Read family of Bendigo was one of the first to join the Race For Fun Club this week. Amberlie Read and her son Cobi, 13 months, visited the Campbell’s stables to meet “Addy” yesterday. “It’s the first time Cobi has seen a horse. 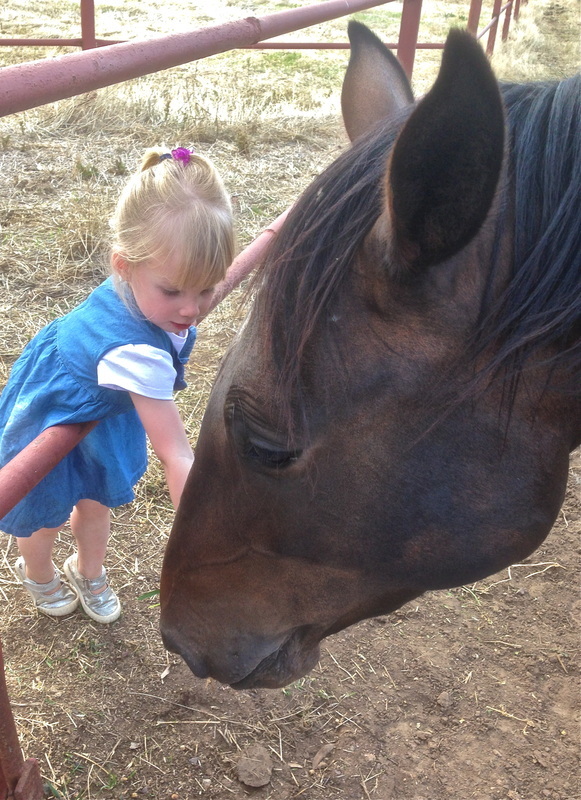 He loves animals and we hope to get our own horse one day,’’ Amberlie said. Amberlie said the family had joined the Race For Fun Club because it was a fun way to help out a charity. Follow Addy’s progress each Tuesday in the Bendigo Advertiser or find out more about the club by visiting www.bendigoadvertiser.com.au and clicking on the Race For Fun Club logo. "I am enthusiastic about the Addy horse, he told the Advertiser in a visit to Bridgewater late last week. "Its a terrific initiative and I hope the horse becomes an absolute champion," he said. A vet by profession Dr. Napthine said he is alos looking forward toi "looking Addy over" when he next visits our region. Victorian and interstate businesses are stepping up to support the Addy's Race for Fun Club with 18 individuals or busiunesses to date sponsoring the filly, the club and ultimately assisting in raising funds for local chariities. Some sponsors are providing the day to day necessities for Addy while others are supplying benefits for members, including prizes for future Race for Fun Club competitions.